National Grange has had a set-back with the building this past August. During a Washington, D.C. heat wave, the chiller for the building’s air conditioning unit failed, leaking water and providing no AC to the building. They were able to cobble it but it is in need of replacement. So a call went out to all State Granges if they have extra monies to loan the National Grange to replace the AC and heating plant. They are 20-30 years old. Who says Grangers aren’t thrifty? The latest report of the California State Grange litigation is that the National Grange is winning. The judgments have all been in favor of the new California State Grange and the National Grange, and many judgments are being won because of lawyers flip-flopping sides. I guess they don’t have our values if they felt they could get away with it. The Pomona Realignment is in the works but patience must be had. The Mentors are trying to set-up meeting times but fairs, installations, and State Session may slow down the process until later. You can still talk about the new Pomona Granges amongst yourselves but please do not make any decisions without the Mentors. The Northeast Lecturer’s Conference at Castleton University in Castleton, VT was enjoyable as usual. The programs were very good and the skits were funnier this year. I’m sure everyone will laugh at the skit from Maine about math. The only glitch was at the end when there were questions about the future of Leaders’ Conference, Lecturers’ Conference and Youth Conference. There have been complaints of out of pocket expense, activities at conference that were not beneficial to membership growth or leadership training. So the New England leaders have established a committee to look into combining, eliminating, redesigning the format, or leaving them alone. The problem is lack of attendance. Lecturers’ Conference had 70 people attending. This is the lowest in many years and was a loss of $4,000 to the conference committee. Not every state pays for Committee Chairs to attend Leaders’ Conference as we do in Connecticut. Some breakout groups had few in attendance, while others just socialized. With today’s technology, we all can video conference from our homes and save lots of money. We need to review everything. Even the New England Grange Sunday in NH needs to be reviewed. You drive three hours (from CT) and have a forty minute service and then drive home. This year there were 40 members, with three of them from Connecticut. Our elderly members are not going and the younger members and new leaders are missing the chance to see what happens outside their own Grange Halls. 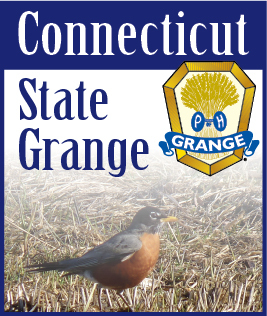 State Grange Session is just around the corner with changes in the schedule for the Banquet and the Sixth Degree. We are hoping more will attend this year. The more people staying at the hotel lowers the rates for everyone. The more that attend the Banquet, the lower the coast of the Banquet. Please join us in celebrating your hard work and celebrate with us, you may just like it. E is September 24th. Hope to see you at the parade. Many local Granges are having fairs. Get out and visit them and show your Grange spirit.